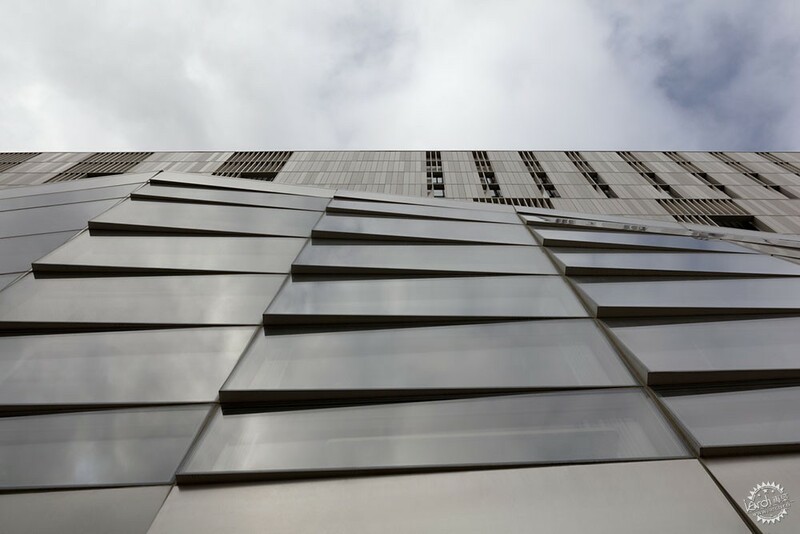 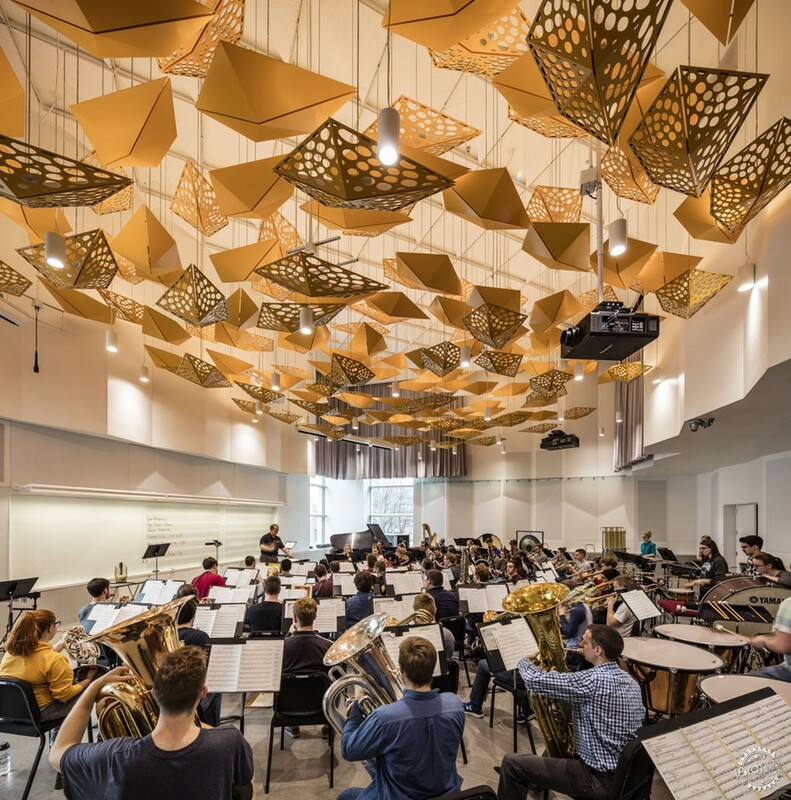 The Voxman Music Building celebrates musical performance at every turn, embracing a collaborative and exploratory student-driven model of education that treats every space as performance space. 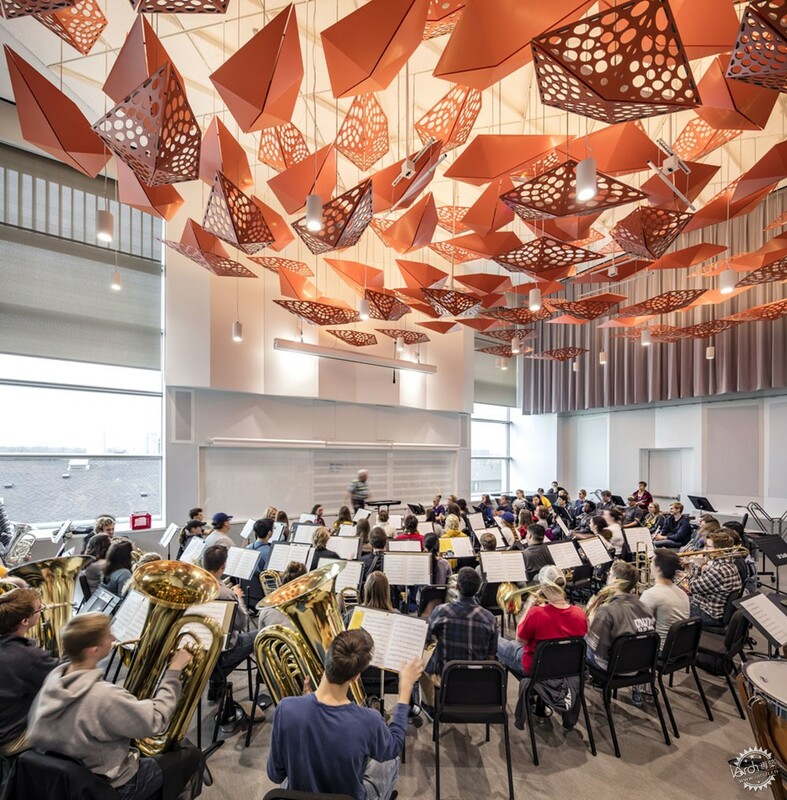 The building shares this sense of musical discovery with the community through a transparent expression. 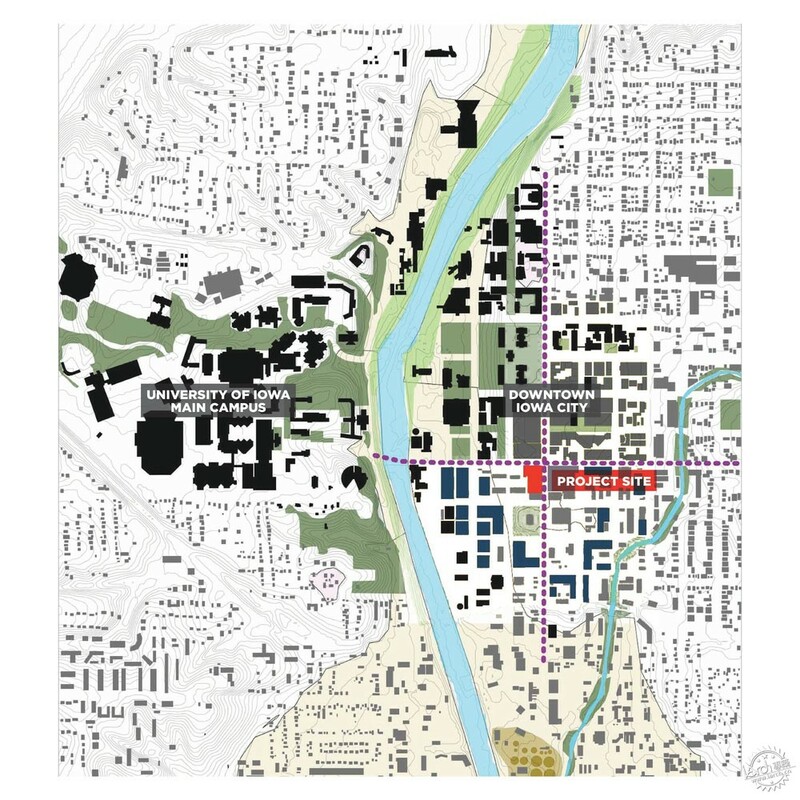 The pattern of streets and open spaces in the mixed-use district of Iowa City extends directly into the building’s multi-level interior spaces, cultivating a sense of vertical urban vitality and acknowledging its place within the community. 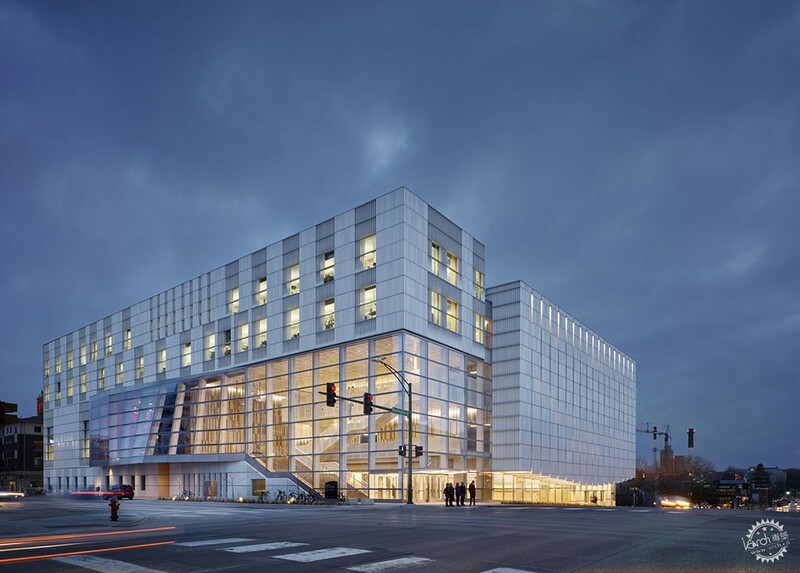 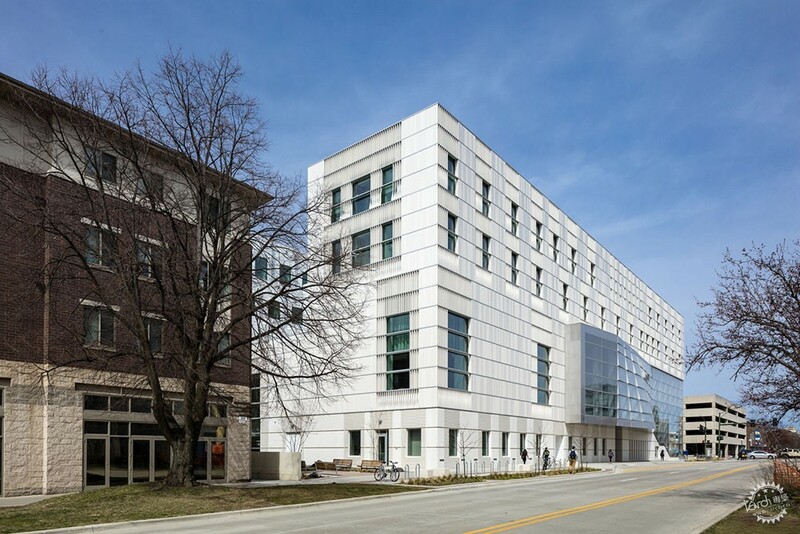 The six-story, 186,000 square foot building is situated between campus and the downtown core of Iowa City, embracing both academic and urban experiences. 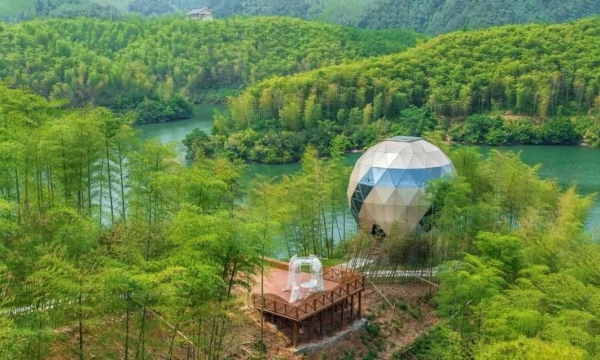 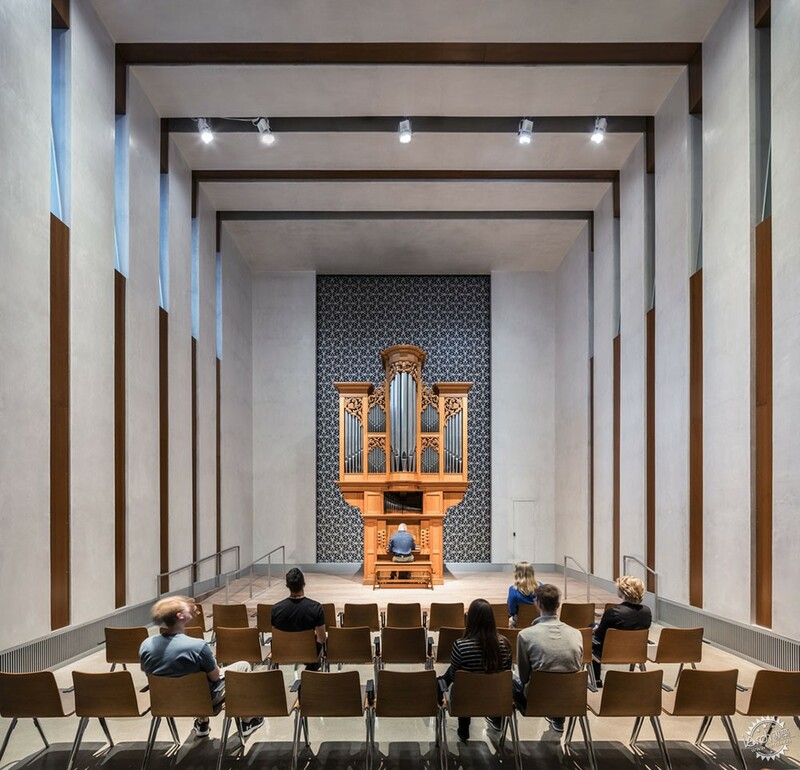 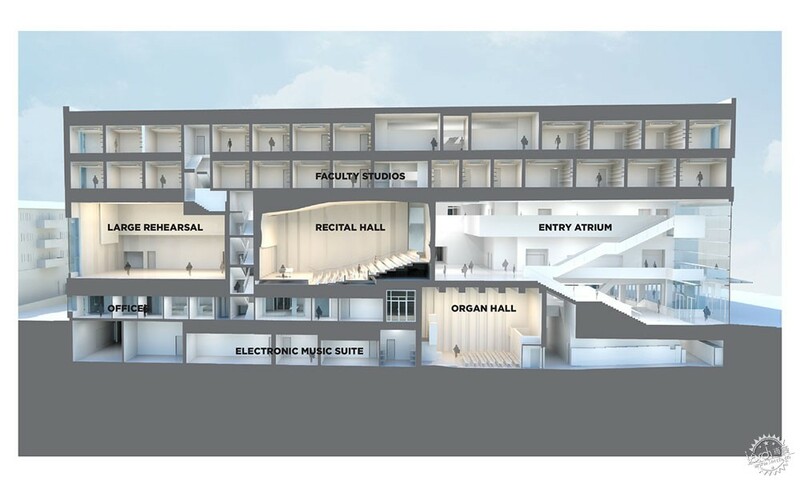 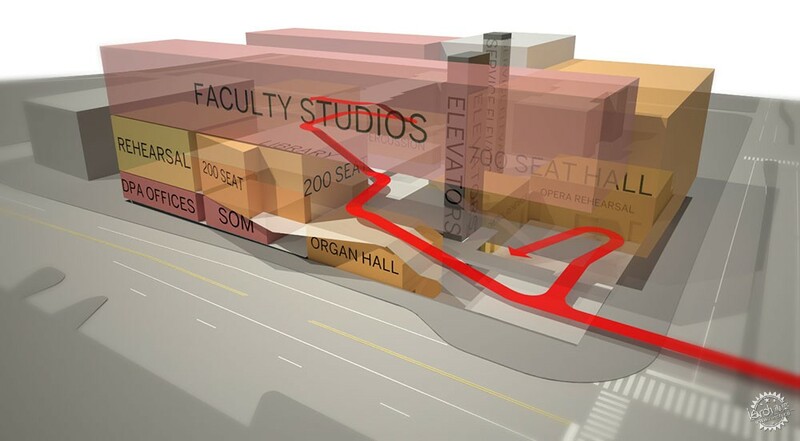 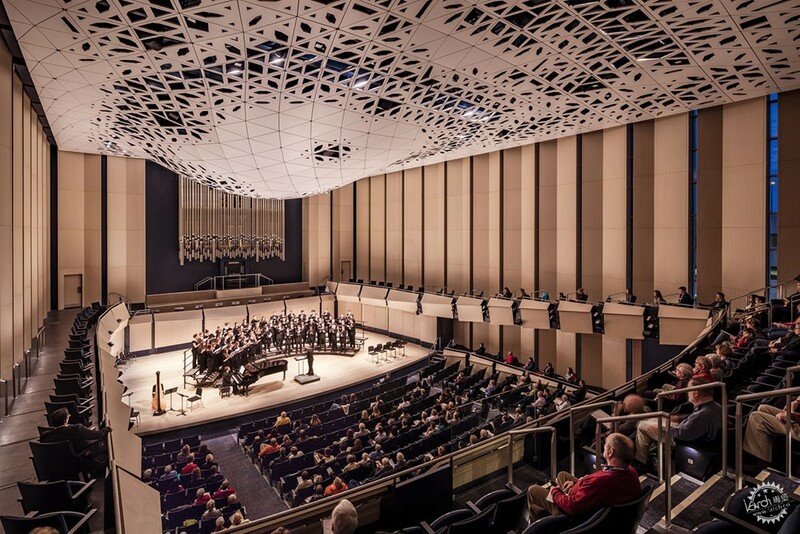 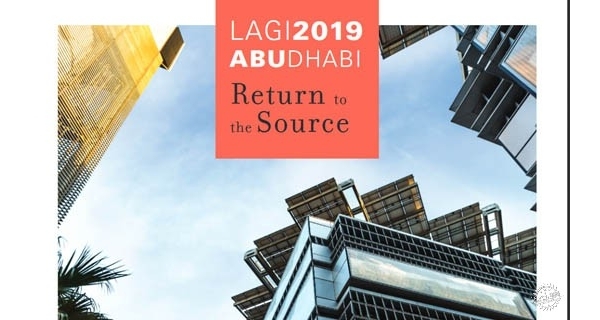 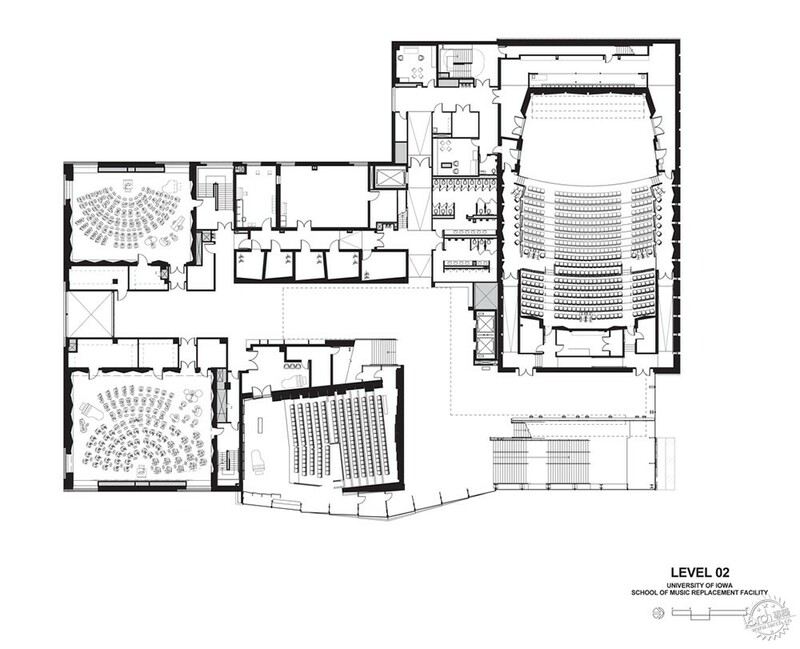 The program comprises a 700-seat concert hall, a 200-seat recital hall, an organ performance hall, a music library, rehearsal rooms, practice rooms, classrooms, and faculty studios and offices linked by a series of vertically connected community spaces. 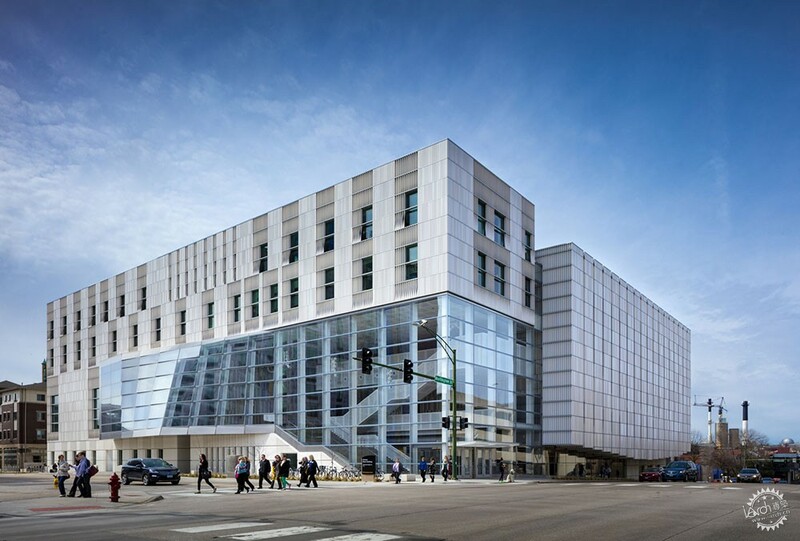 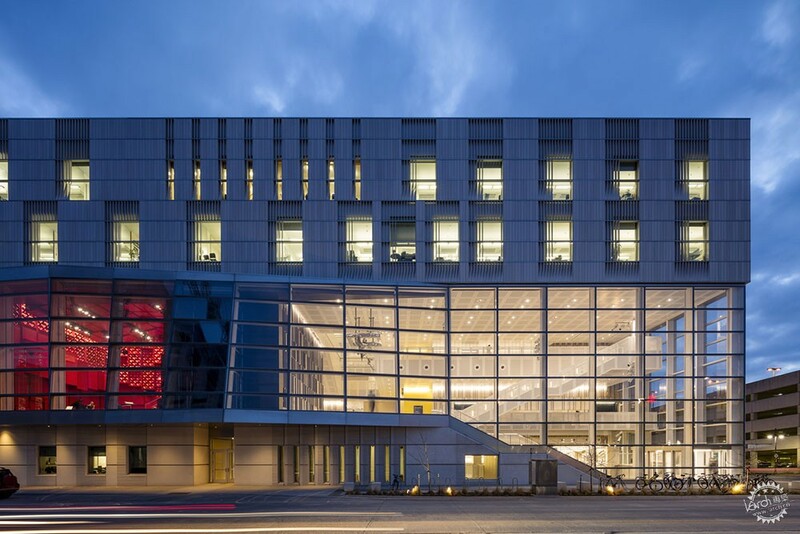 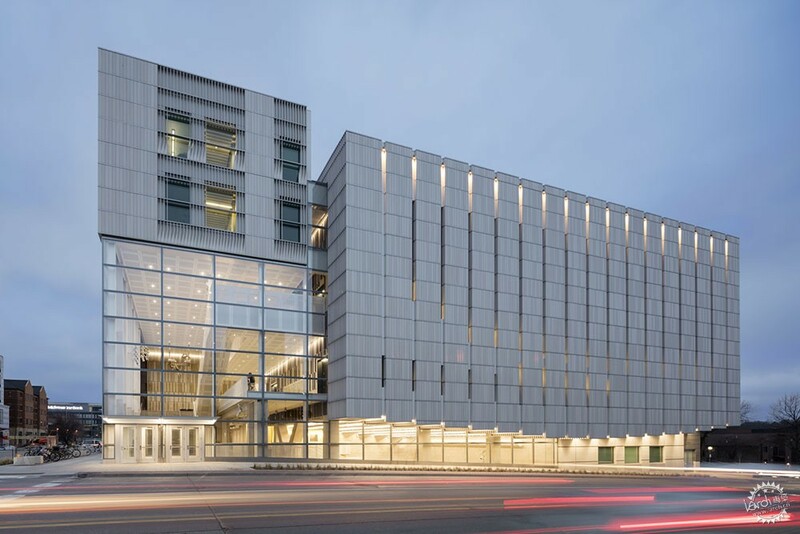 A multi-story glass corner entry at a major downtown intersection reinforces the merger of campus and city, with the two major performance venues marking their presence on each of the main facades. 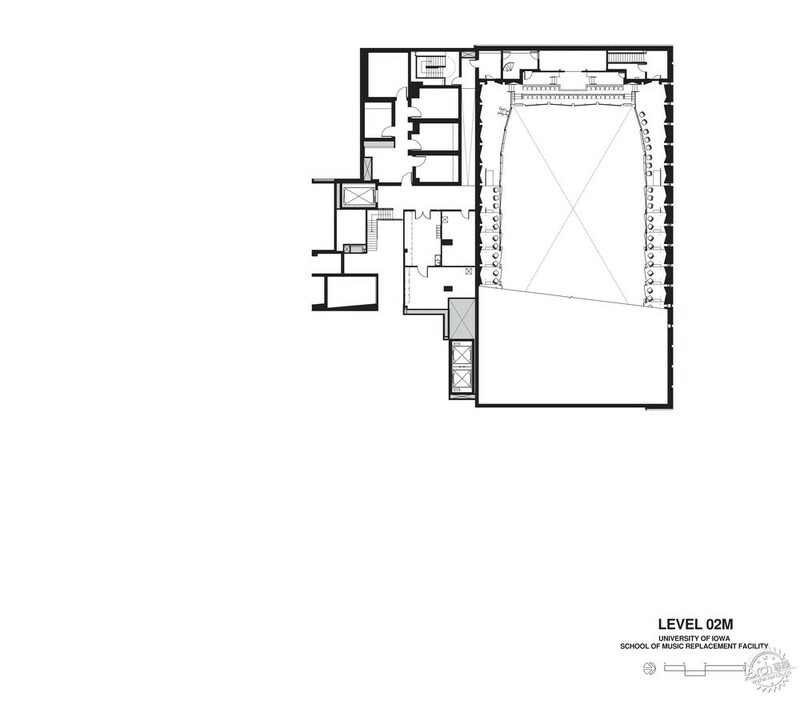 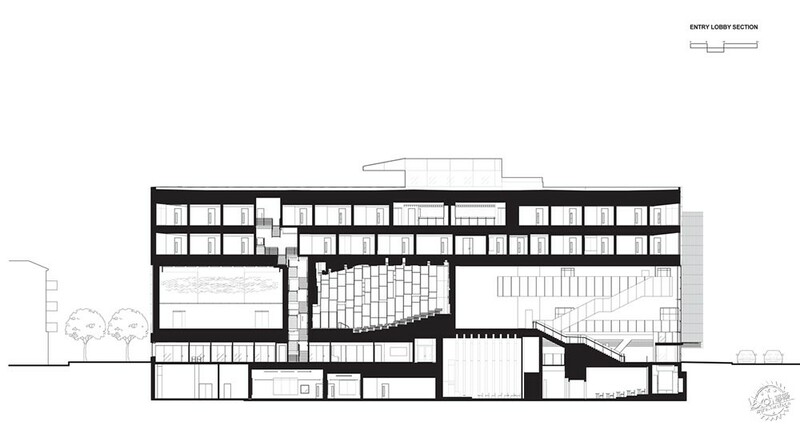 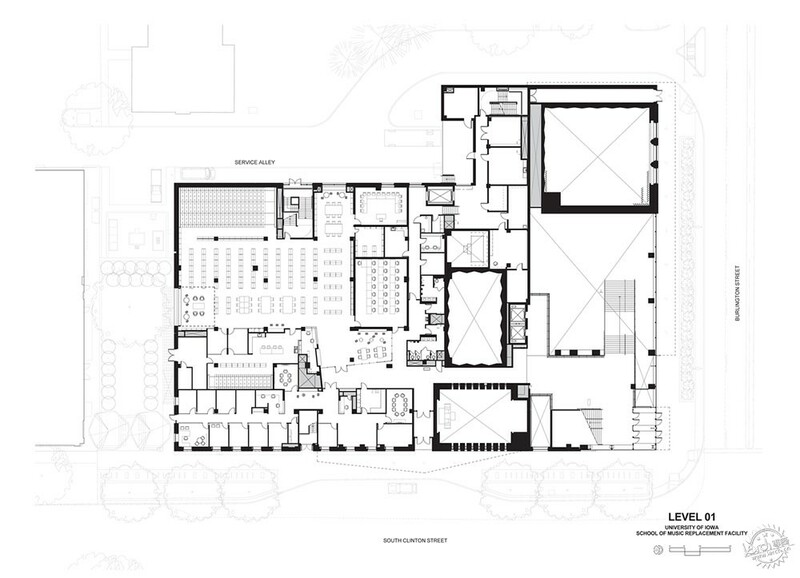 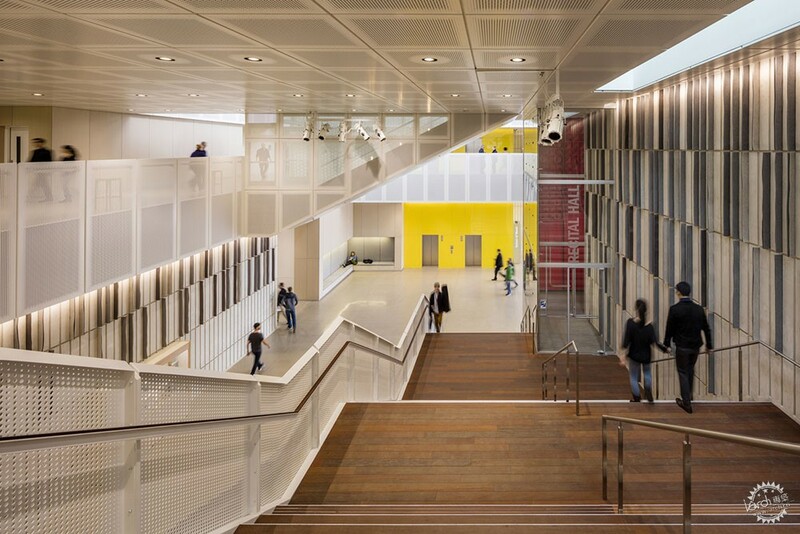 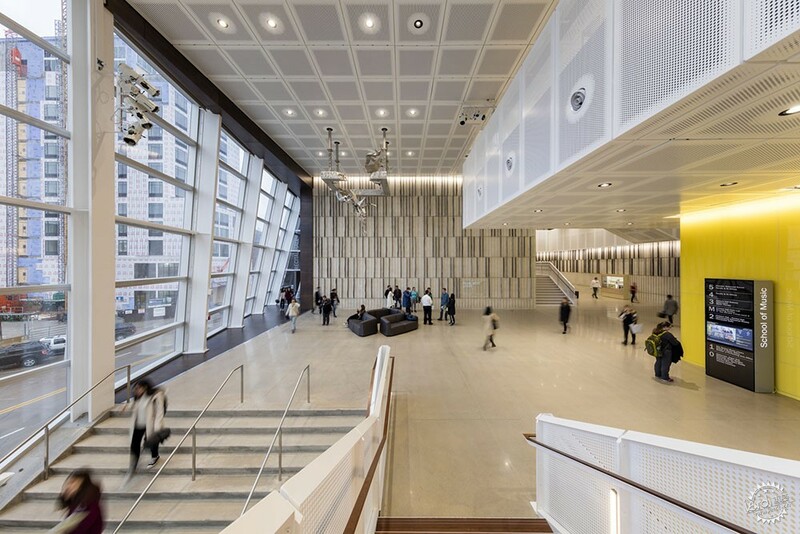 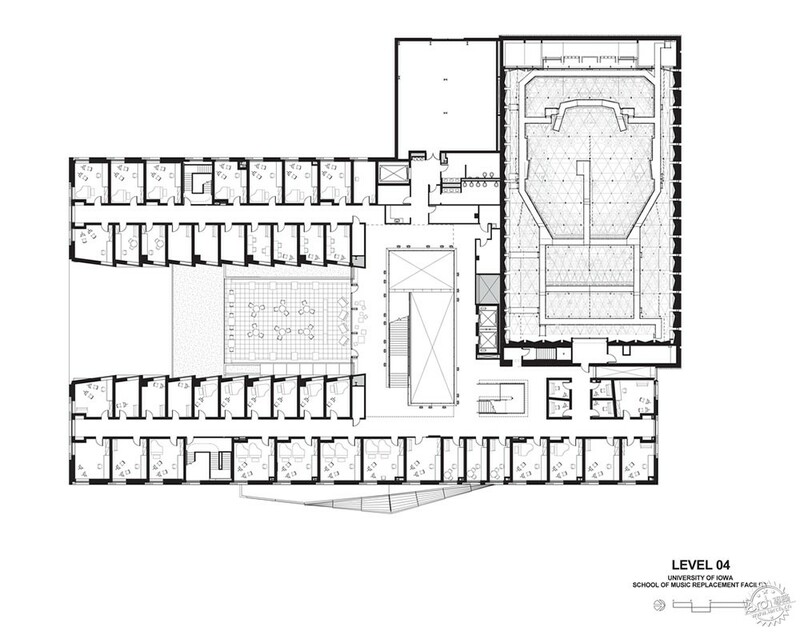 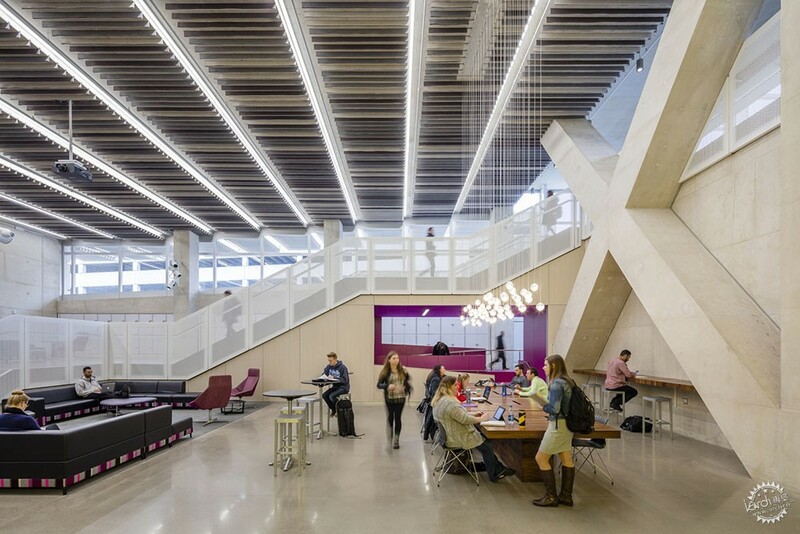 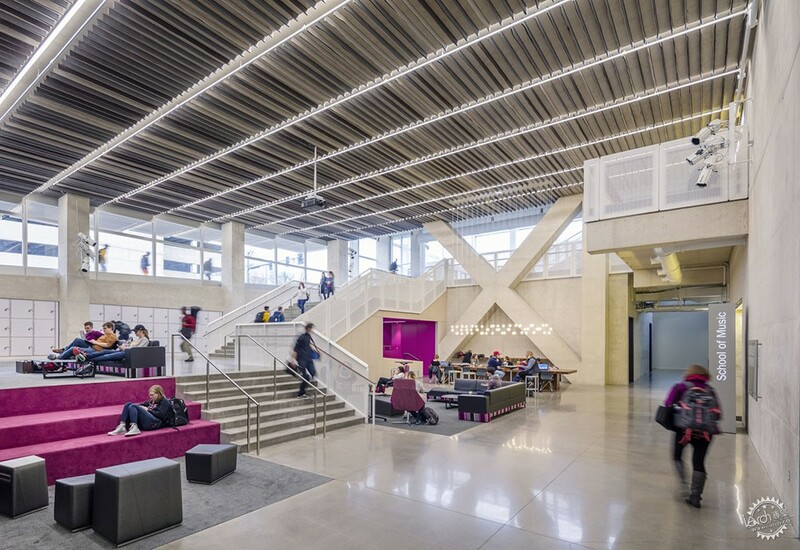 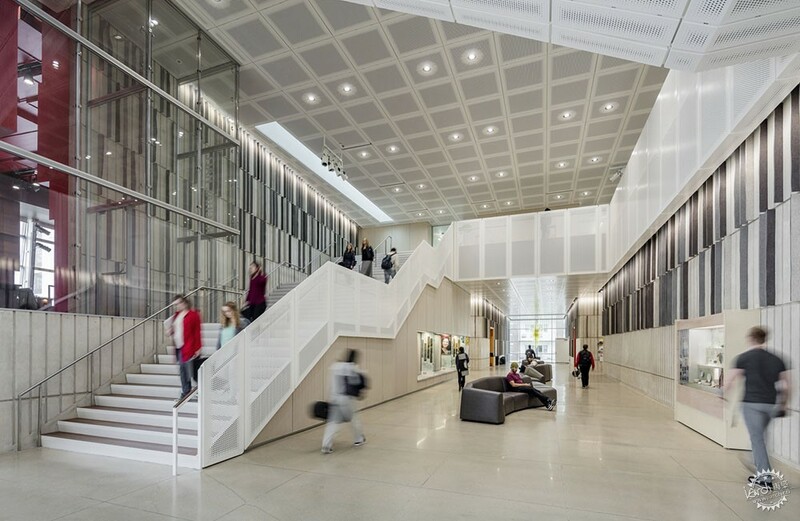 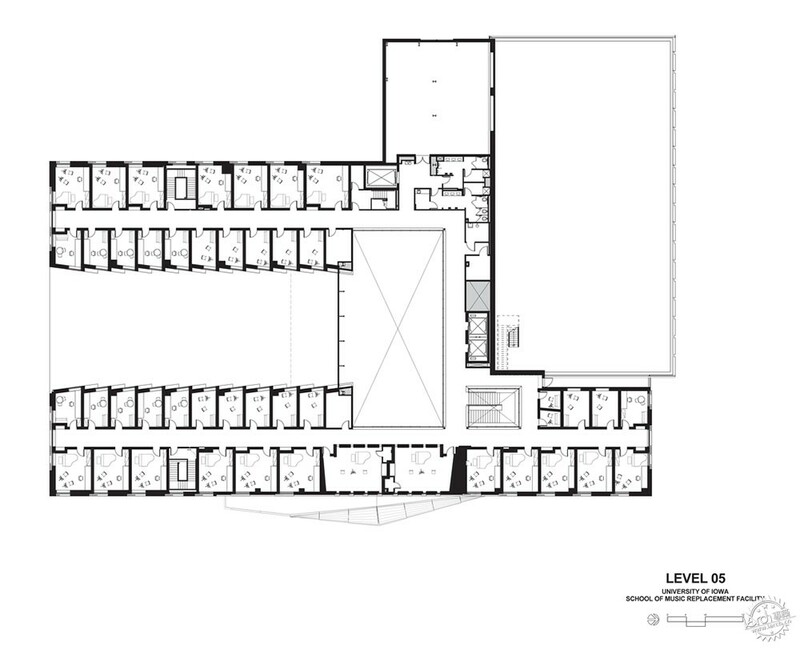 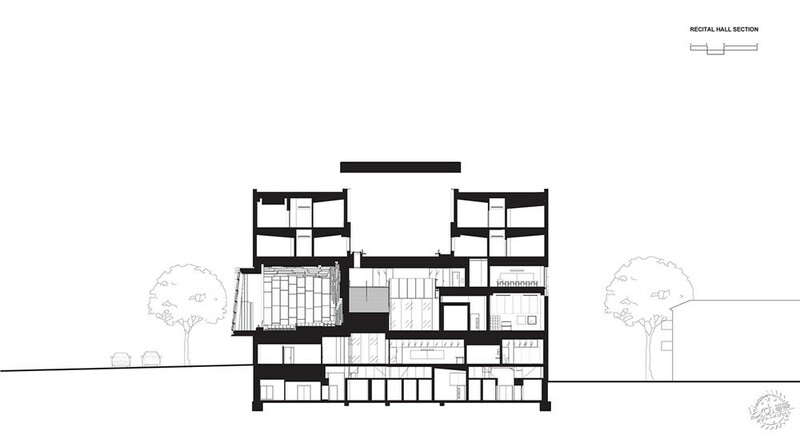 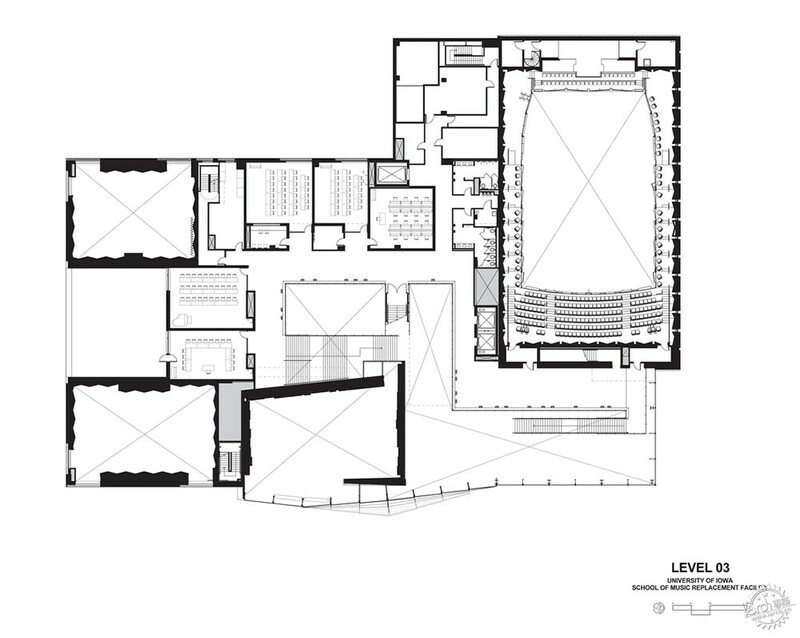 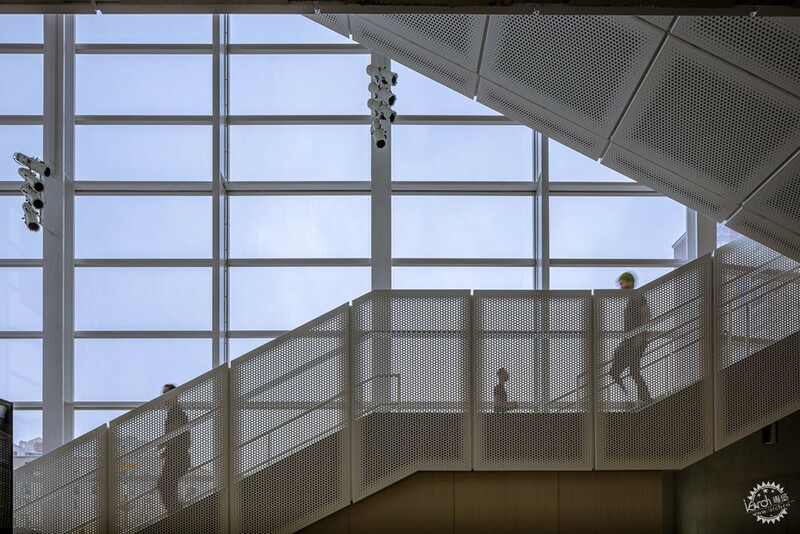 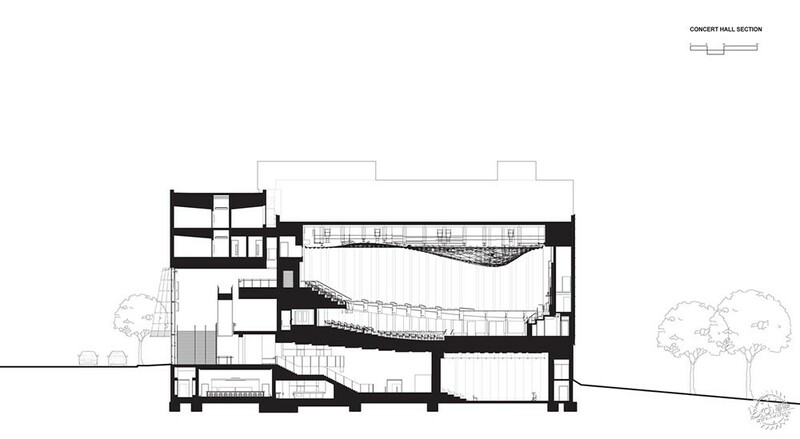 Between the performance spaces, porous, day-lit circulation volumes interlink to form the student commons, performance and rehearsal lobby, and a three-story atrium. 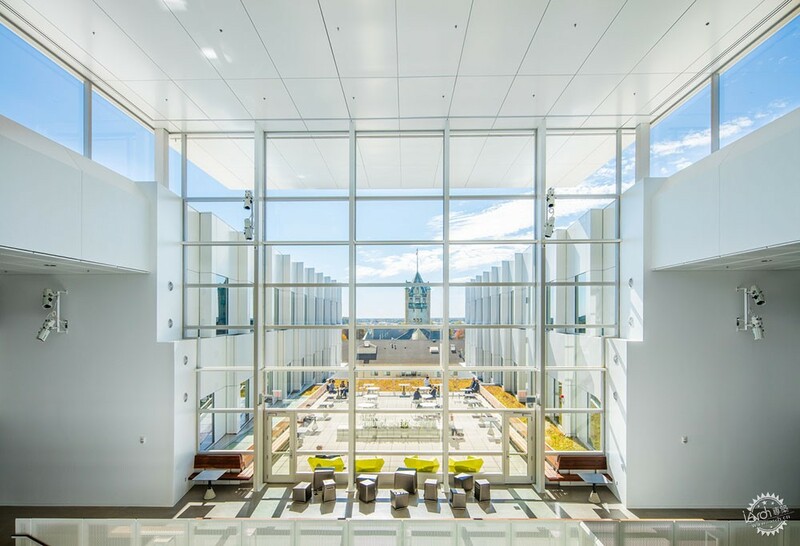 A fourth-floor exterior terrace, nestled between the wings of the rear facade, serves as gathering space that frames views to the city’s historic courthouse and countryside beyond. 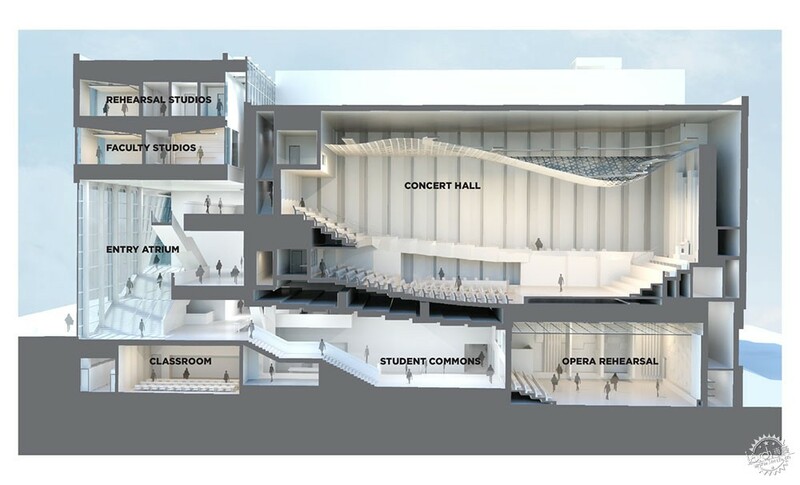 The concert hall cantilevers over the Burlington Street sidewalk and the Student Commons below, while the recital hall, wrapped in a shingled-glass wall system, reaches out over the South Clinton Street sidewalk. 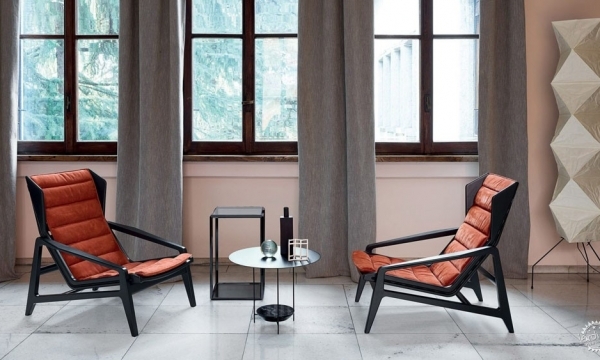 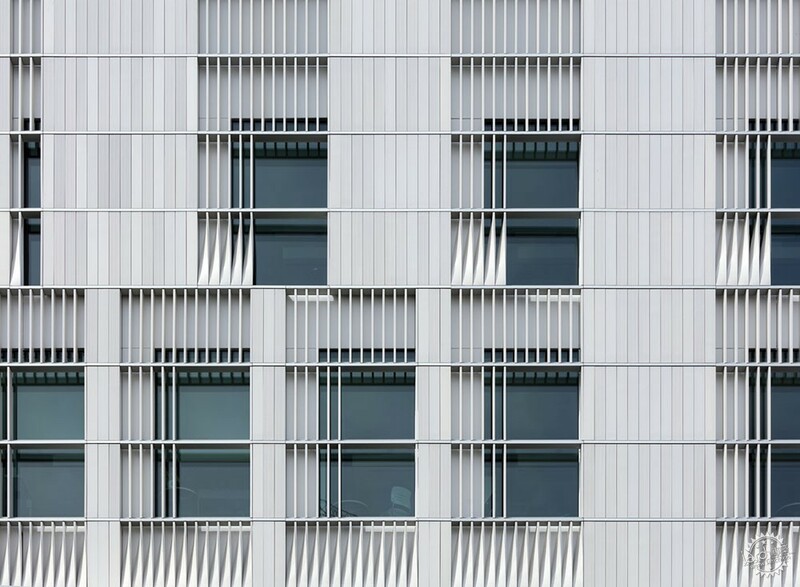 A composition of subtly textured terra cotta panels and low-iron glass with delicate shading patterns wraps the full exterior. 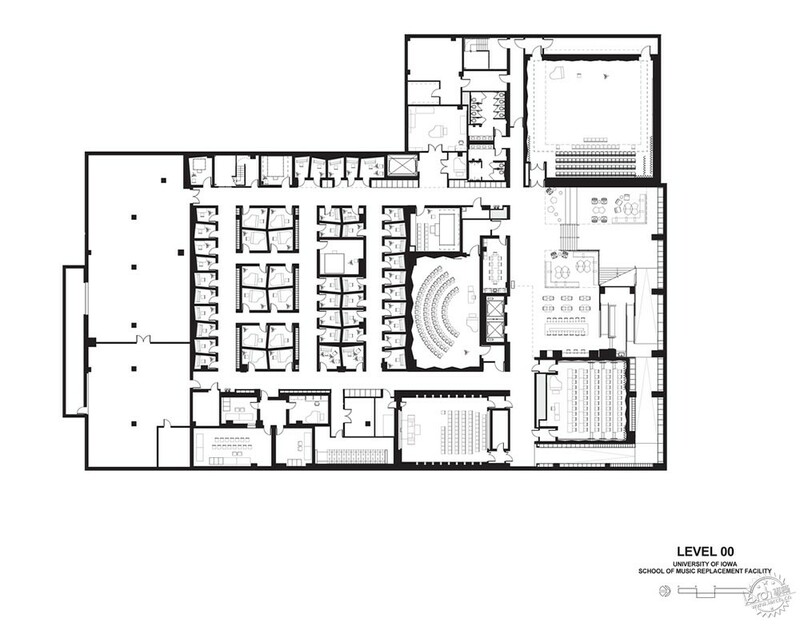 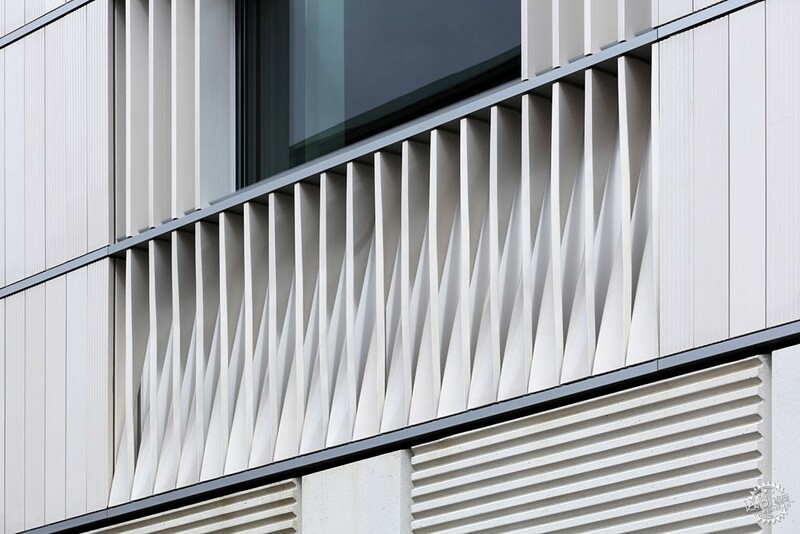 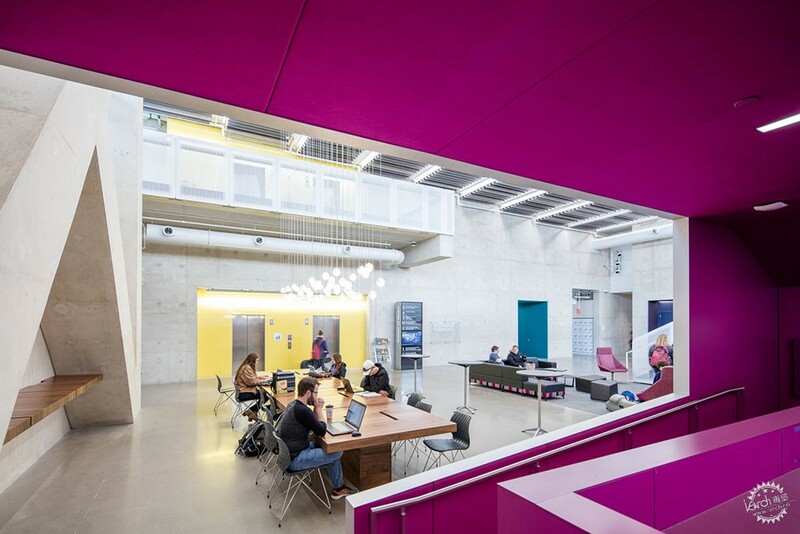 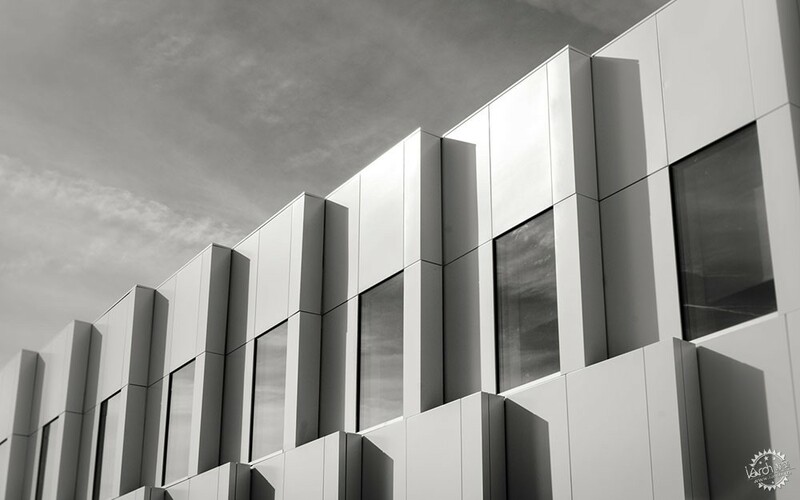 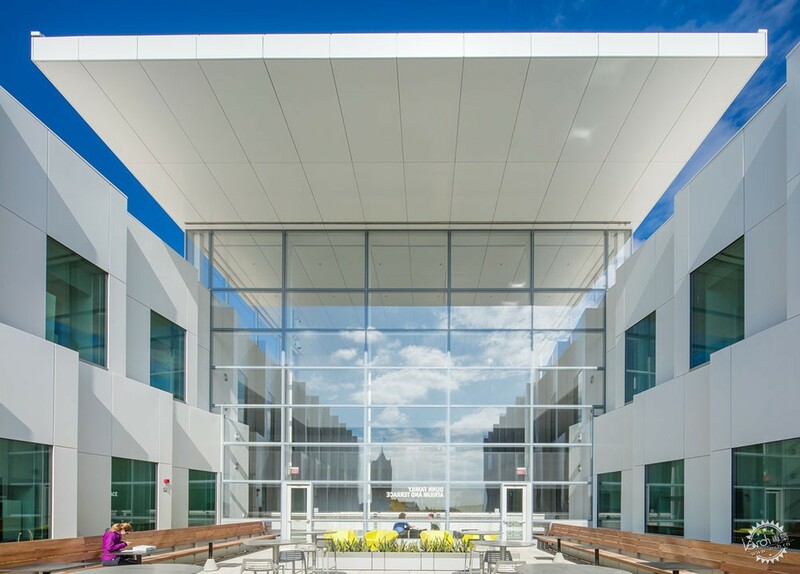 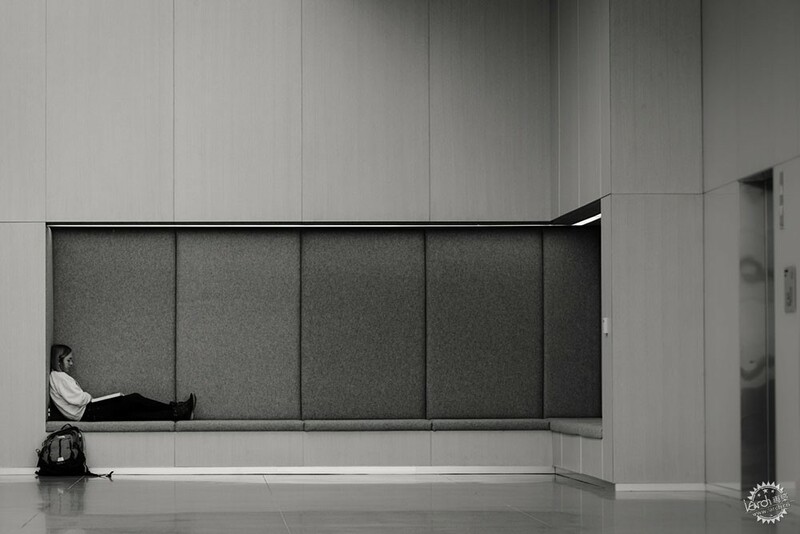 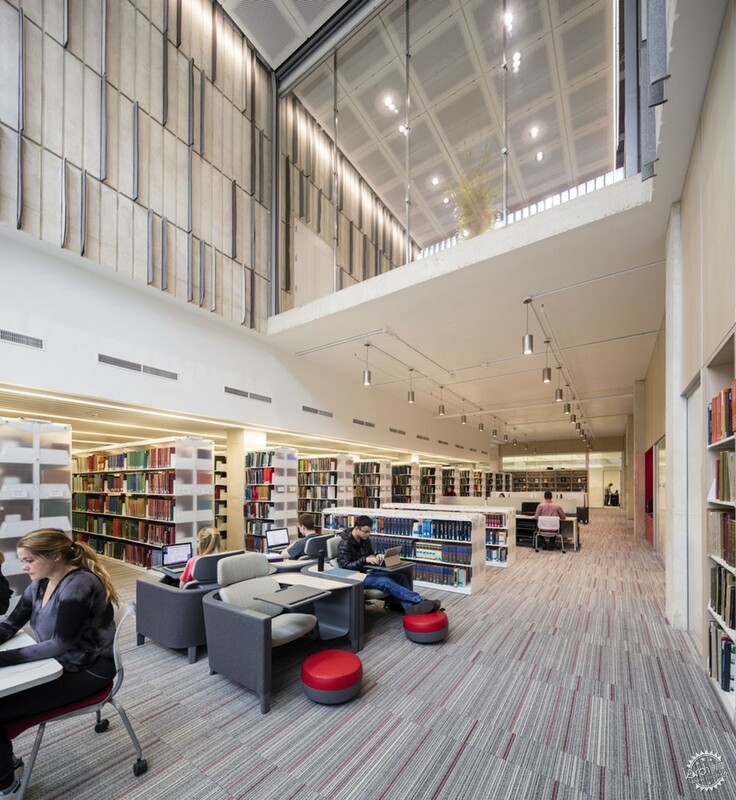 All spaces in the building, including performance halls, rehearsal rooms, offices, and common areas, provide natural light and connections with the outside while maintaining acoustic isolation. 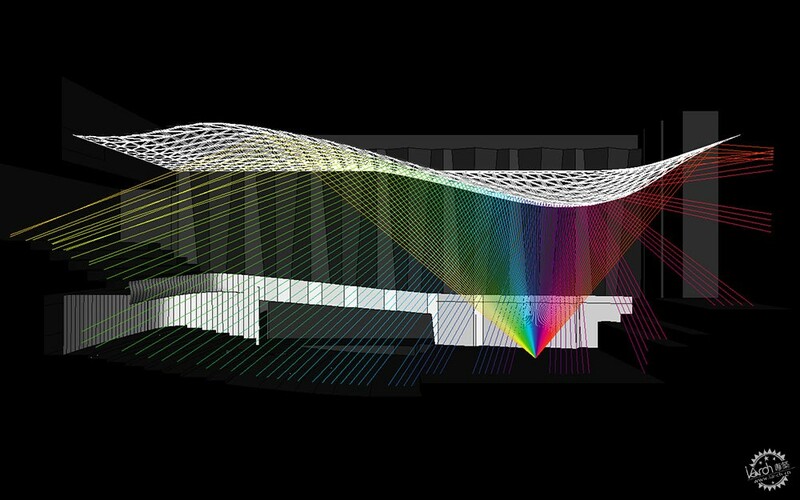 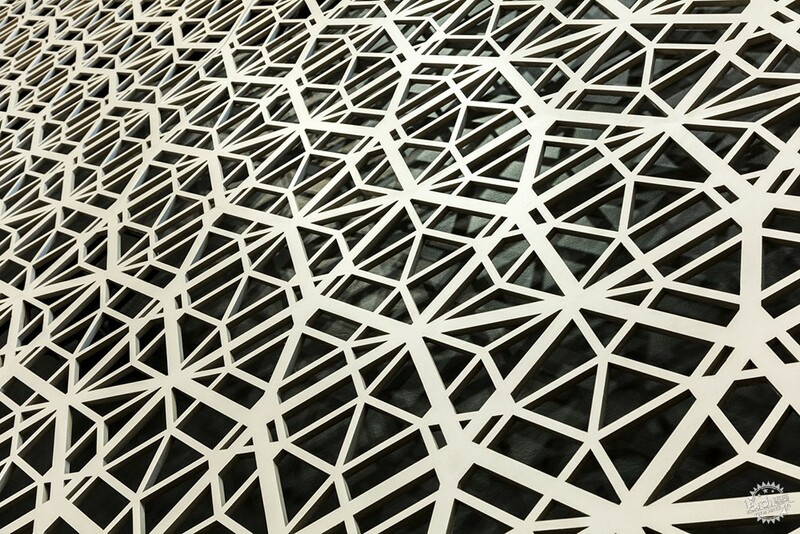 Requirements of the facility’s high-profile performance spaces are met by high-performance digital design. 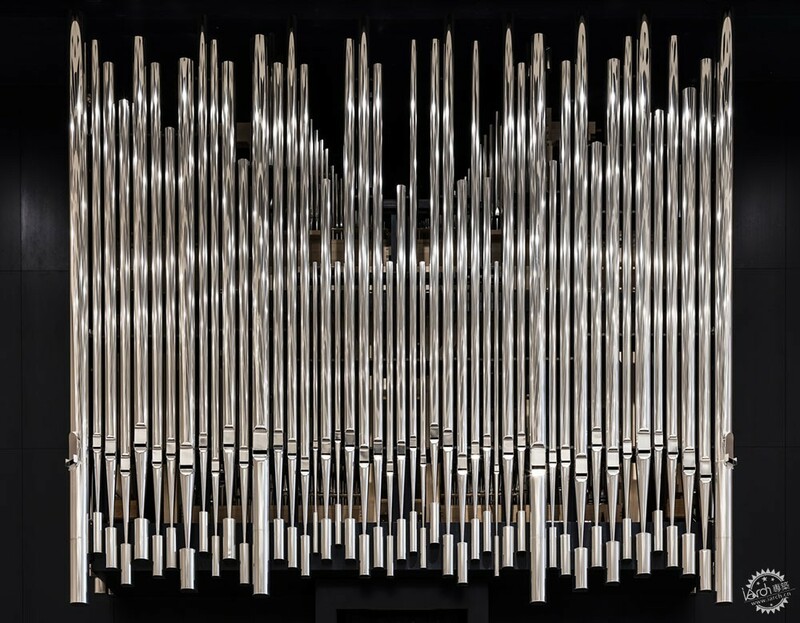 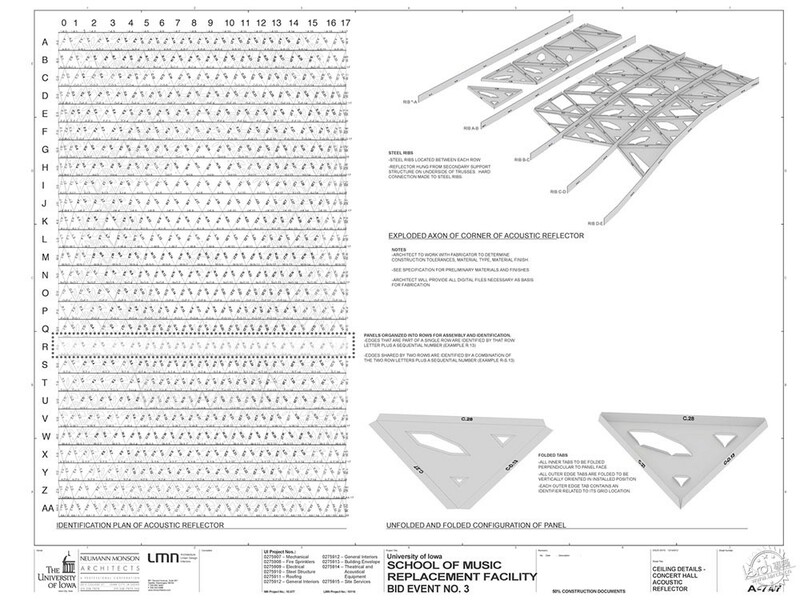 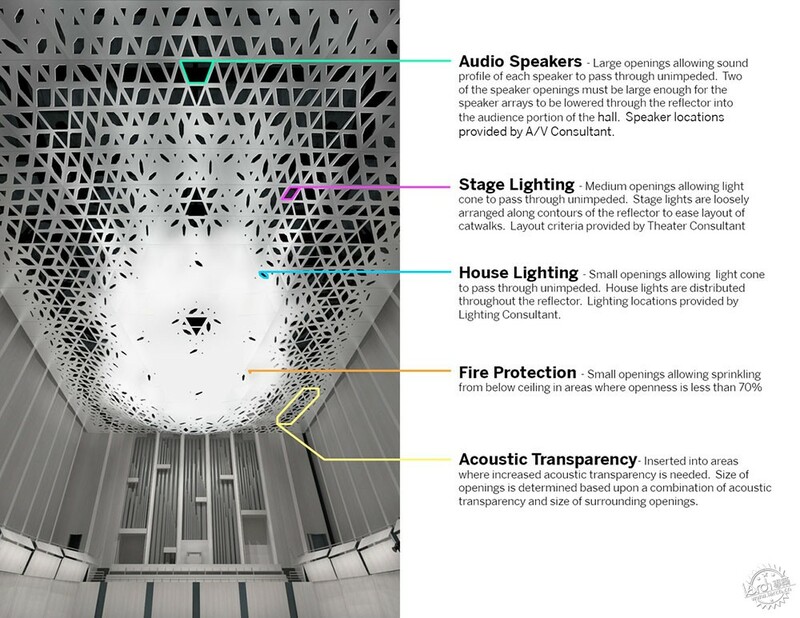 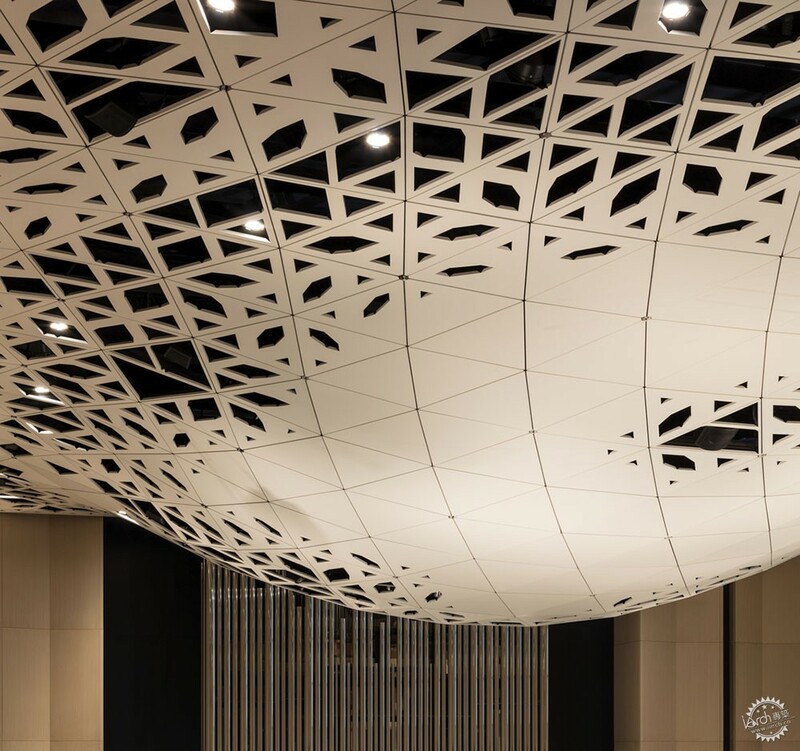 The concert hall features a suspended “theatroacoustic” system, unifying acoustics, lighting, and life-safety requirements into a dramatic, multi-functional architectural expression, and the resulting intricately sculpted element is assembled out of 946 unique, folded-aluminium composite modules digitally fabricated from modules digitally designed and fabricated from the architects’ parametric model. 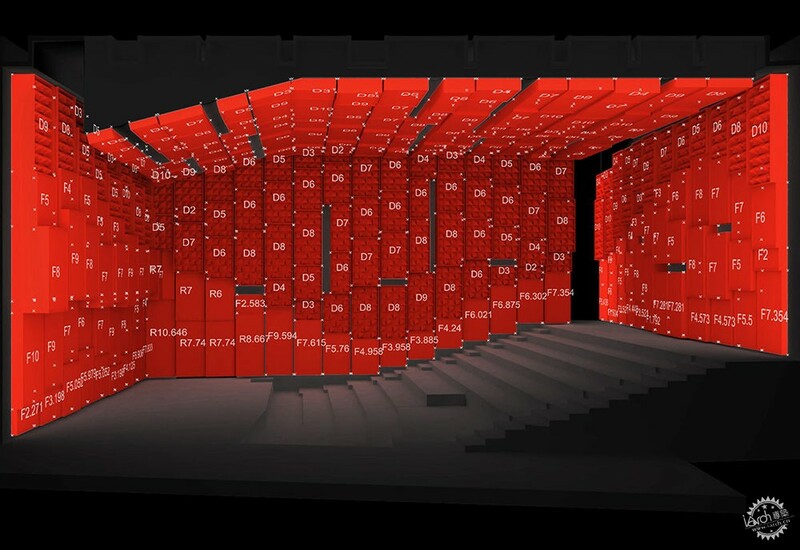 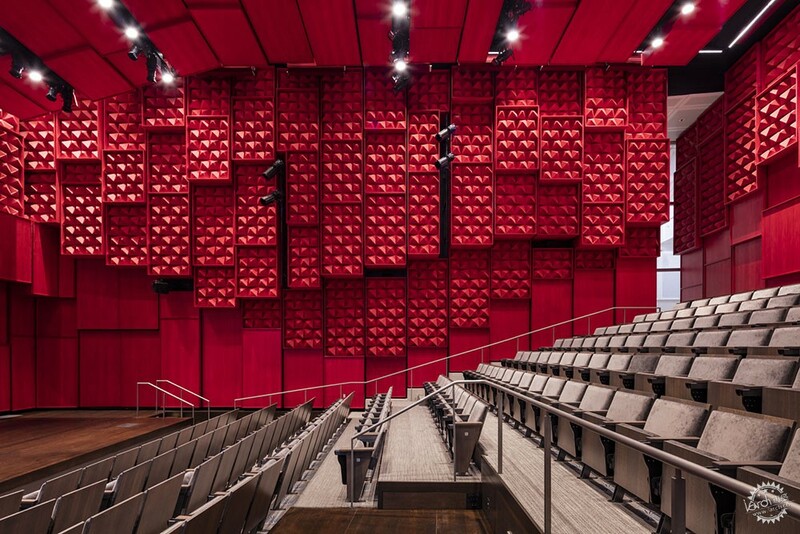 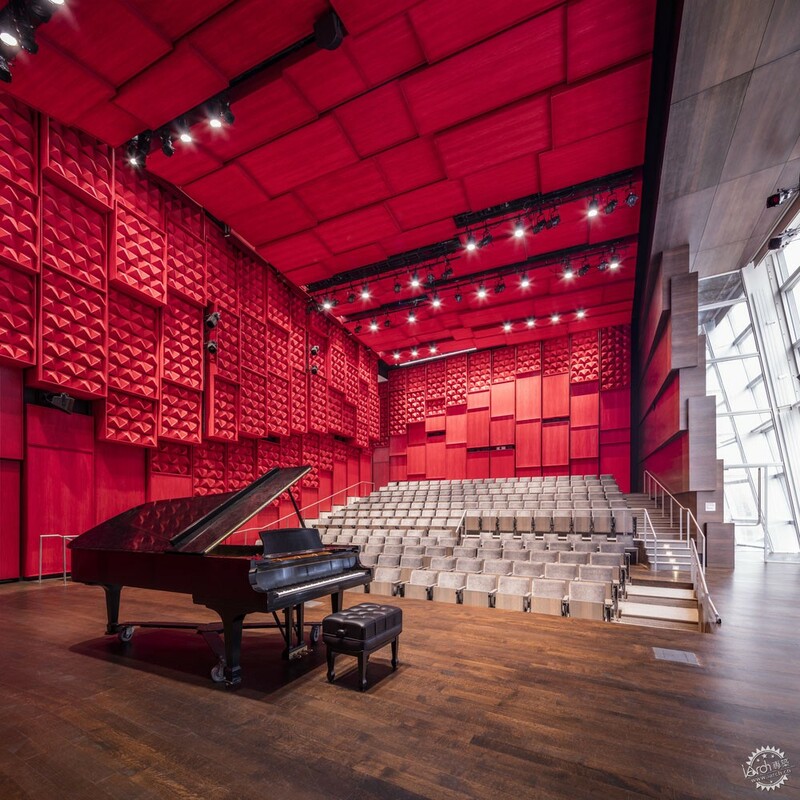 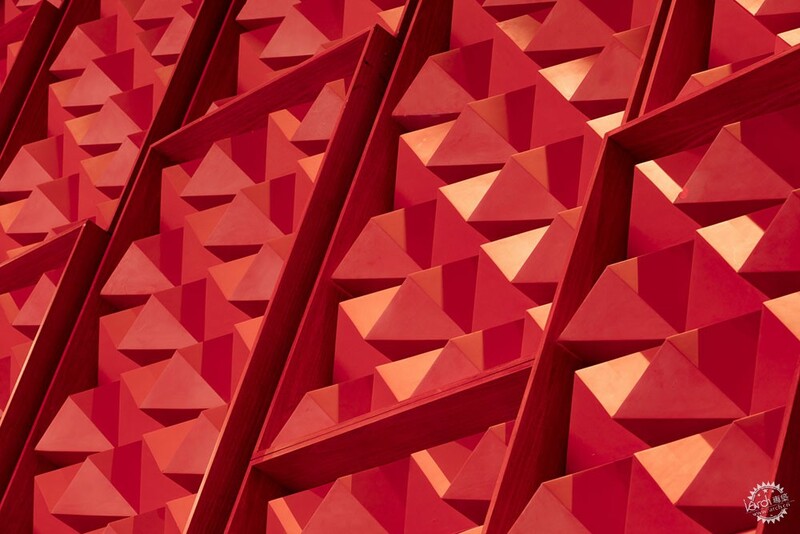 In the recital hall, red-coloured acoustical panels optimize the room’s acoustical properties while incorporating a wall-sized shingled-glass window that unites the performance event with the urban experience. 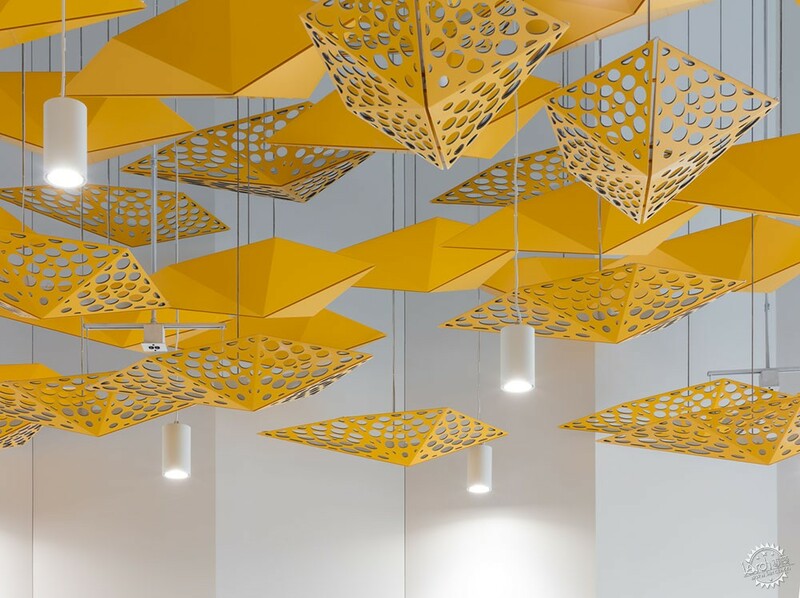 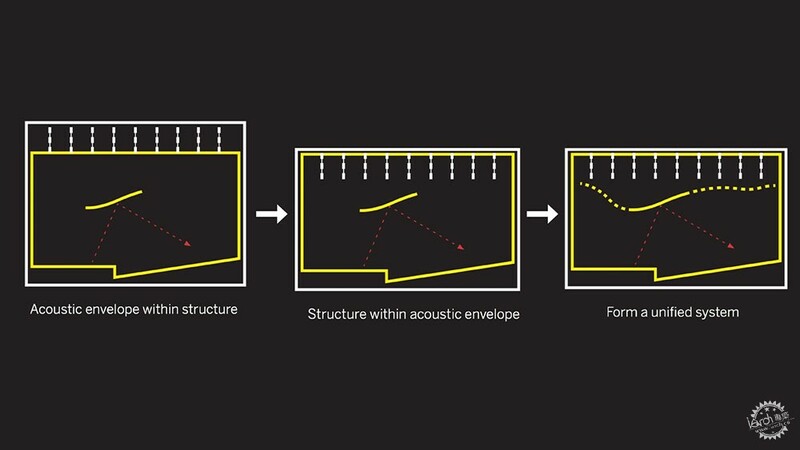 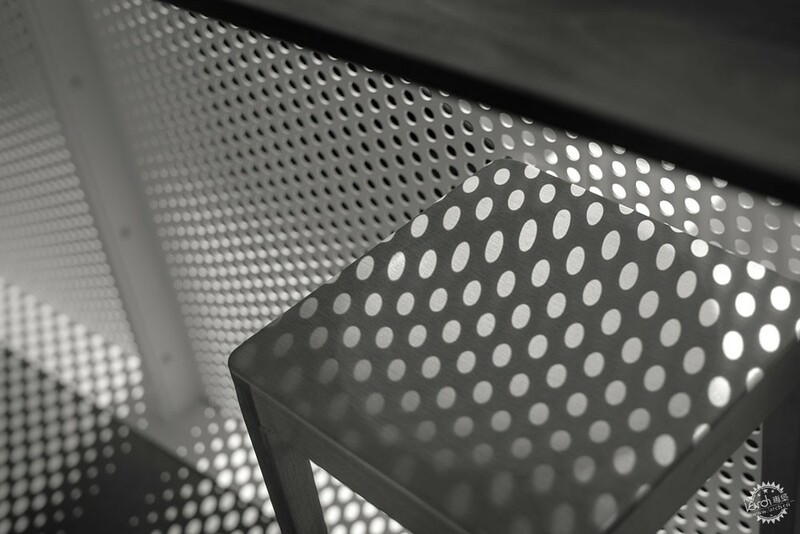 In the three major rehearsal spaces, high ceilings are filled with swarms of brightly coloured, kite-like reflectors that vary between solid and perforated to achieve dynamic acoustical and lighting effects.